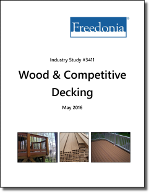 US demand for decking is forecast to increase 1.8 percent per year through 2020 to 3.6 billion lineal feet, valued at $7.1 billion. Rising consumer confidence will promote gains in the large residential improvement and repair market, as homeowners who postponed decking projects in the aftermath of the 2007-2009 recession undertake them going forward. Increasing market share for wood-plastic composite and plastic decking materials will boost value gains, as these products are sold at a higher price point than wood decking. Alternatives to wood decking, particularly wood-plastic composite and plastic, are expected to experience above average annual gains in demand through 2020, as these materials generally require less maintenance than wood. Wood-plastic composite decking is popular with consumers seeking decks that have longevity while maintaining a wood-like appearance. The rising use of capstock-coated decking, which provides enhanced protection against mold growth and premature degradation, will further boost wood-plastic composite decking demand. Plastic decking demand will be driven by the increased adoption of cellular PVC decking, which resembles natural wood and provides strong protection against the elements. Companies mentioned include Georgia-Pacific, Universal Forest Products, Arch Wood Protection.